I feature a variety of flora and fauna in my science fiction romance, Liberation’s Kiss. One of the most fun scenes to write was my heroine Cressida skinny-dipping in an isolated island lagoon. I wanted to populate the island with interesting-sounding flora and fauna. What says tropical better than palm trees and orchids? When it came to fauna, however, I wanted to push the boundaries without making up something completely fictional. And that’s when I learned about two real animals: mudpuppies and hellbenders. To the people who live near these creatures, they are completely ordinary, but to my foreign ear, even their names sound unique. They are two species of salamanders. The hellbender is a species of giant salamander native to eastern North America, and the mudpuppy is a smaller aquatic salamander from much the same area. Now, the salamanders where I come from are tiny. It’s exciting to see one because they are usually scooting off into the foliage, visible for only a few moments in the muddy forest. 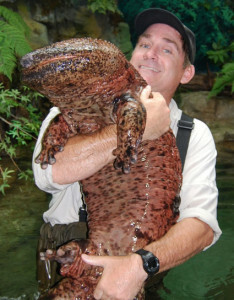 Giant salamanders, though, can really look strange! This is a YouTube video of a giant salmander in Japan: https://www.youtube.com/watch?v=KBh-E0iXjHU. And here is a guy holding one: Imagine taking a swim with one of these? She scooted out of bed, sliding from the thick rumpled sheets down to the polished wood, and padded to the closet. Several different types of outfits hung in the closet, most of them optimized for her size range. Well, she’d always known she was the General’s type, even if she didn’t ever interest him enough to be invited here. She slid into a morning robe, fastened the belts, and walked down the stairs as the clothing stretched and shrank to fit her body. She ate a large breakfast of creamy fried banana cakes with date muffins and sliced fruit glace. It had only been three days of starvation. Would she never be full again? She put away her dishes – tidy, tidy – and stepped out on the back terrace. Decking led to mossy steps in the soft forest floor. She waded through a crowd of purple butterfly-catchers, ducked beneath a curtained fig tree, and emerged in a sheltered lagoon. Water flashing as a green coin ebbed against silver rocks, gently rocked by a tinkling waterfall. Paradise-birds flittered over the water, tempting brassy fish and harrying the gentle hellbenders and smaller mudpuppies paddling below the shadows of the rocks. She dipped in a toe. Warm and gently fizzy on her skin. She undid her robe, eased into the water, and glided gently into the center of the pool. The water slid up around her legs and armpits, into her unfamiliar places. Home bathing was restricted to mist showers or reclaimed orbital standing-baths that swished the water around her in a claustrophobia-inducing tube. Nothing like the natural luxury of this freedom. She flipped over on her back and stared at the sky. Overhead, the wind whipped the trees, but here it was a pocket of calm. Somewhere up there, in the almost-visible stars, were her parents. Also somewhere up there were the robot empires satellites.